It’s quick and easy to clean green with DIY recipes. The biggest reason to start making your own is because of all the toxins that store-bought supplies have. There are, of course, products that are toxin-free- but many of them are a bit pricey, so there’s another good reason to do-it-yourself. Plus, then you’ll know exactly what ingredients are in them. 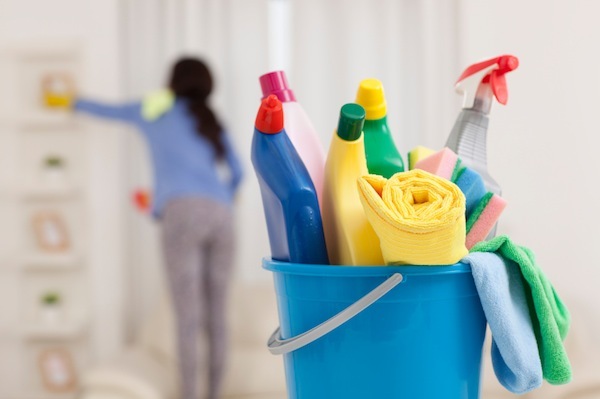 A lot of people use vinegar and baking soda for many of their cleaning supplies. They’re both great and very useful- but adding essential oils to them can really enhance the cleaning power. As for which essential oils to use in the five green cleaning recipes, you can pick whichever ones you prefer. Lemon is high-ranked—and not just with green cleaning. Look at all the products on the market that are lemon fresh. It’s antibacterial, antifungal, antimicrobial, and antiseptic. It’s great for grease and grime. Tea Tree—Antibacterial, antifungal, antimicrobial, antiseptic, antiviral, fungicidal, and insecticide. Tea tree is a good choice for heavy-duty cleaning, even garages. Works well as a disinfectant spray, too. Lavender—Antibacterial, antifungal, antimicrobial, insecticide and smells oh, so good. Peppermint—Its antibacterial and antimicrobial properties make it a good choice to add to your DIY cleaning solution. Eucalyptus—Antiseptic and antimicrobial—great choice whether you’re cleaning the floor, bathroom, or mirrors. Sprinkle baking soda and a few drops of the essential oil of your choice in your sink. Pour a little vinegar over it and let it bubble for a few minutes before scrubbing. This is also a great mixture to keep your drains unclogged. Combine ¾ cup baking soda with ¼ cup of Castile Soap in a bowl. Add 1 tablespoon of water and 15 drops of tea tree essential oil. Stir until you get a pasty consistency. If you need to, add a little more baking soda. In a spray bottle, combine 1 cup of white vinegar, 1 cup of distilled or purified water, 15 drops of lemon essential oil and 10 drops of tea tree. In a spray bottle, mix 2/3 cup of white vinegar, 1 1/3 cups of distilled or purified water, and 5 drops of your choice of essential oil—lemon and lavender are great in this recipe. Shake and spray. Mix together 1/2 cup baking soda, 1/3 cup liquid dishwashing soap, 1/4 cup hydrogen peroxide, 3/4 cup of distilled or purified water, and 30 drops eucalyptus essential oil. Put into a squeeze bottle or other container. Use it to scrub the toilet and then leave it for about 15 minutes. There you have it. These five recipes will get you started to a cleaner, greener home. Start your kit today and save up to 70% !